This tutorial makes a 9″ finished block (9 1/2″ unfinished). 1. Draw a diagonal pencil line from corner to corner on each white square. 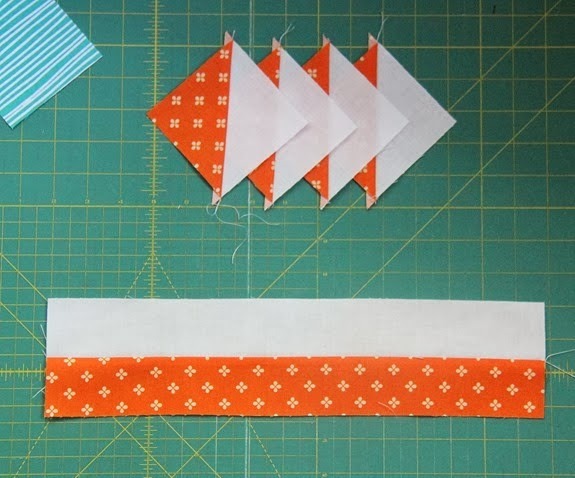 Place the white squares and print squares right sides together, sew a scant 1/4″ on each side of the pencil line, cut down the pencil line, and press towards the print fabric. 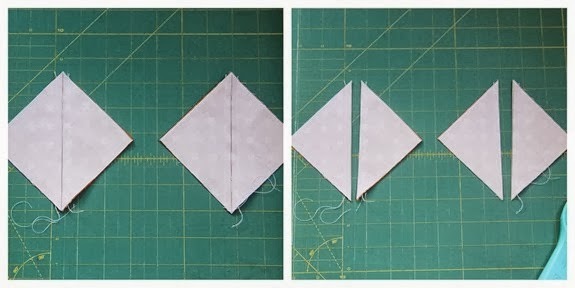 That was a mouthful…here’s a better look at making half square triangles if your brand new to it. When your done you should have four half square triangles that measure 3 1/2″ each. 3. 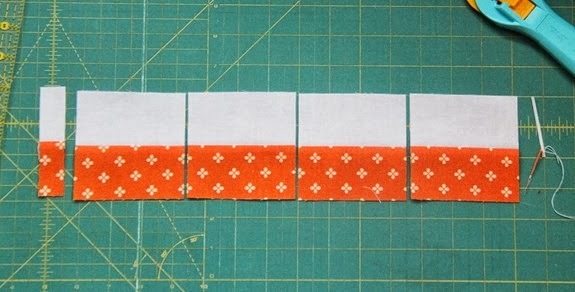 Cut the strip until into four squares 3 1/2″ each. 4. Layout your pieces into the block. Sew the pieces into 3 rows. Press top and bottom row seams towards the center unit, and the center row seams towards the outer units. 5. Press the block well, it should measure 9 1/2″. Happy Churn Dashing! A better look at my whole quilt top can be found here. 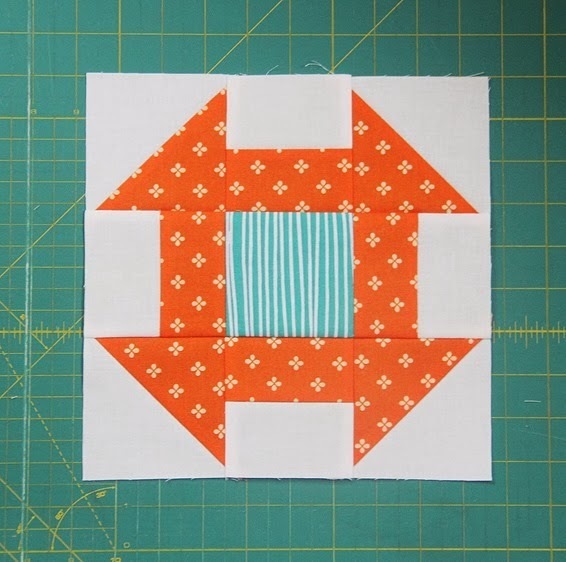 I love this block – it looks great in all sizes. Thanks for the tutorial. Thank you for the tutorial. Have a baby quilt to make soon for a friend. This would be just the block to use! What nice clear instructions! I wish I had them when I was making this as a baby quilt for a friend. For the center square I used some of my vast collection of cow prints (don't ask why – I don't know). So the name of the quilt was The Cows Came Home Through The Hole in The Barn Door because I was told that was another name for the block – Hole In The Barn Door. 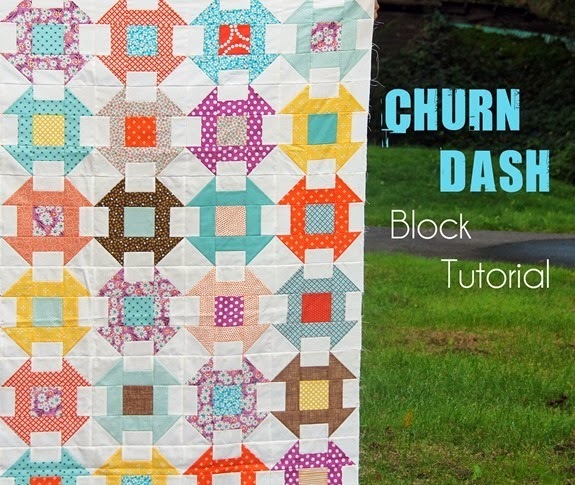 I love the churn dash block. I have a WIP with that! Thank you for the churn dash tutorial! Hope to make this some day soon! Love the quilt! Thanks for the tutorial! Often wondered how these were done. Great Tute. Thanks. What a beautiful and well-made tutorial. I haven’t begum my first quilt; I’m still in research mode. Thank you, you’re and inspiration. Oh I just love that you did this for me! 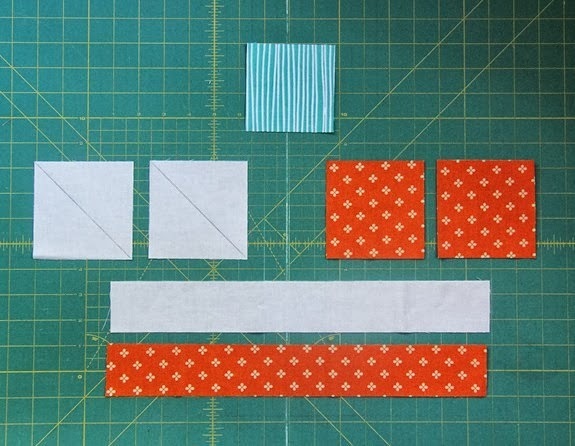 I am new to quilting and want to try all the blocks and you have done all the math for me! Thank you thank you! My 19 yo dtr saw this quilt and thought it looks so trendy for a traditional block. She also is in drool over your bunnies. She tracked back through your blog for all the bunny pics. Thanks for sharing the joy! Have a blast! What a great tute, thanks! What size did you make your quilt and how many blocks did you need? Thank you, Thank you, Allison. I will start with a fat eighth or a layer cake and a charm pack of your new line. It may be a while because we plan to move, but when I finish it I will send you a picture. You had me at quick-ISH!! I just loved finding your beautiful work!! and shared this idea on my page…loved it!! Omg you are awesome!!!!! I have been wanting to do this pattern forever!!! I am a beginner and mostly self taught so HST's still intimidate the crap out of me lol. I am so stoked. Thanks so much for sharing! 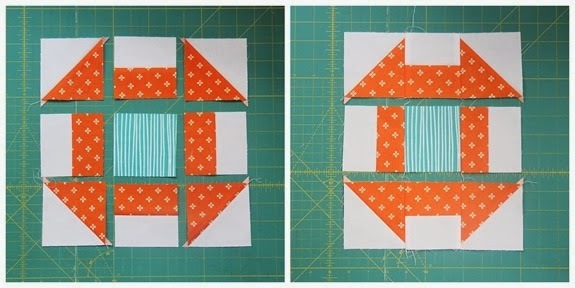 I love this block – am in the midst of planning out a quilt for my son's twin bed using this tutorial, and doing it 7×9 squares. Do you have any idea of the yardage you used for the background of this one? I know yours is smaller than what I'm planning, but if I could not start totally from scratch figuring that part out, that would rock. Thank you!!! Hi Catherine! I don't have the exact yardage for the backing and I can't remember if I ever even figured it out! I would guess 4 yards though…that's usually about right for the background on a twin size. Sorry!